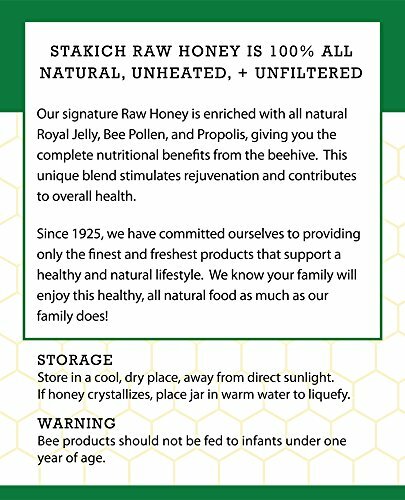 Stakich Royal Jelly Bee Pollen Propolis Enriched Raw Honey starts with our signature Raw Honey and is enriched with all natural royal jelly, bee pollen, and propolis powder. We make every effort to be sure that all of its naturally occurring enzymes, amino acids, vitamins and minerals are fully preserved. Raw Honey is a remarkably long-lived food and will not spoil. 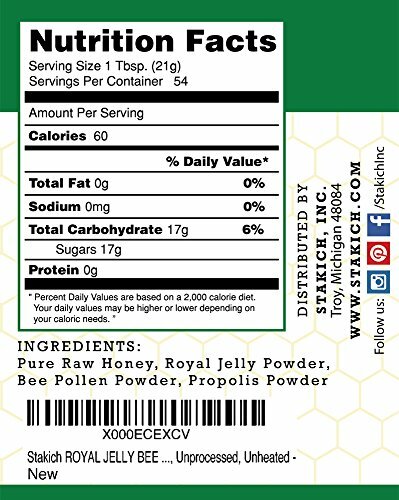 Stakich Royal Jelly Bee Pollen Propolis Enriched Raw Honey is 100% all natural, unheated, unprocessed and unfiltered. The beehives are kept in unsprayed and pesticide-free fields, allowing honey bees to collect only the finest nectar from wildflowers. Store honey at room temperature. Do not microwave or refrigerate. If honey crystalizes, place jar in warm water to liquefy. Kosher certified. Naturally cholesterol, sodium, gluten and fat free. Stakich Incorporated was started over 90 years ago with one goal: that can assist you live a healthy way of life with all natural, prime quality products at a price you’ll find the money for. That mission has led us to strive for perfection with the products we sell and the excellent customer service we provide. Family owned and operated from the start, at Stakich Inc. we ceaselessly look for how one can make you healthier by providing only the finest ingredients in the entire products we offer! Check out our additional Amazon listings for various Enriched Raw Honey products, Bee Pollen, Propolis, Royal Jelly, Beeswax, Chlorella, Spirulina, and over 100 Herbal Extracts.